Help change the world by bringing ideas of social justice into your group work practice! Social workers who use hip-hop music to reach out to troubled adolescents. Practitioners who compare First Nations talking circles with social work practice with groups. A retired professor who transforms the way her fellow senior living center residents participate in their world. Fathers of children with spina bifida who help one another through an online discussion group. 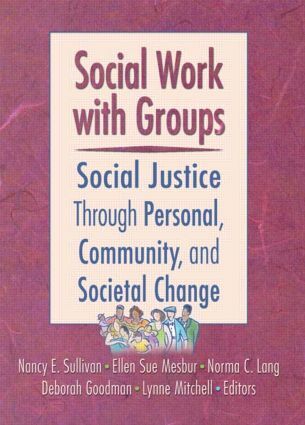 These and other examples you’ll discover in Social Work with Groups: Social Justice Through Personal, Community, and Societal Change will help you to assist groups to gain a sense of empowerment and create change in their own lives and communities. This new book rides the crest of the growing wave of justice in social work with groups. Culled from the proceedings of the 22nd International Symposium of the Association for the Advancement of Social Work with Groups, it gives you the innovations and current thinking of professionals who, while coming from different cultural and professional backgrounds, are focused on helping all people enjoy the same rights and opportunities. If you want to use group work to challenge social inequality, Social Work with Groups will be a welcome addition to your library. Social action that gets results has to start somewhere—let it begin with you! Group Work and Social Justice: Rhetoric or Action?